At the Treasury Building, a pageant of allegorical tableaux was acted out during the procession. District police failed to keep the enormous crowd out of the street, impeding the marchers' progress. Many participants were subjected to heckling from spectators, though there were also many supporters present. The final act was a rally at the Memorial Continental Hall with prominent speakers, including Anna Howard Shaw and Helen Keller. 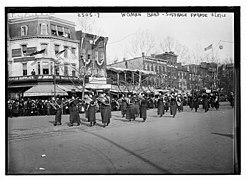 Votes for Women Parade flowers Historical Society of Washington, D.C. Historians have been critical about the movie for several reasons. Director Katja von Garnier created a 21st-century soundtrack and remade the early 20th-century suffragists into "third-wave" feminists that would be more familiar to modern audiences. 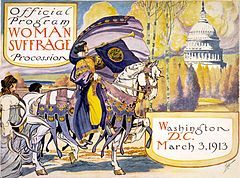 The depiction of Alice Paul's sexuality in the film had no basis in historic fact; Paul was single-minded in her devotion to winning suffrage for women. There is no evidence she had a sexually intimate relationship with anyone, male or female. The movie even creates a fictional character to play a love interest for Paul, cartoonist Ben Weissman. This suggests that Paul needed the assistance of a newspaperman to get publicity for her activist campaign, when in reality, Paul was a highly talented publicist in her own right. This page was last edited on 25 April 2019, at 11:40 (UTC).